The staff table at my work usually focuses on The New York Times crossword puzzle, junk mail and various magazines. This week there was the most amazing catalog from Leslie Hindman Auctioneers. 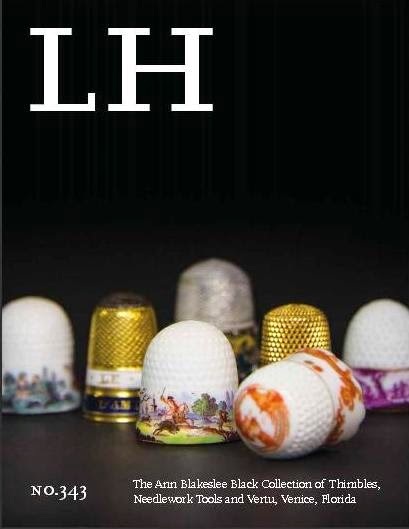 Promoting the May 21, 2014 sale of The Ann Blakeslee Black Collection of Thimbles, Needlework Tools and Vertu this catalog is gorgeous and it's full of unusual needlework tools. You can order a copy of the catalog (about $15) or click here to check it out online.